“Papa its raining”, screamed the little one. “I can see that” I replied without blinking an eyelid. “Then let’s go out and feel the rain” came the demand. “No, you will fall sick” I objected. “But I am strong, you only told me if I eat my veggies I will never fall sick”, the future advocate gave a rebuttal. “The rain is very strong, you will sneeze for 2 hours”, I muttered. “No I will not, mama will make hot soup for me if I sneeze, and I will be ok in 2 minutes”, the future advocate’s future looked bright. “But why do you want to go out in rain?”, I tried to find logic in an emotional need. “Because it is sooooo much fun and masti in rain”, the kiddo is not someone to give up easily. “Only for half an hour papa? Pleeeesee!” the offensive charm continued. I was not sure what to do, as Sasha and the elder one have gone for some shopping and I was babysitting. While in dilemma, Sasha called me and informed she will be late as she wants to spend some more time at the mall as it was raining. My logical brain started doing calculations immediately. Sasha will not start from mall for another one hour from mall; she will take half hour to reach back after starting. This gave us a solid 1.5 hour to soak in rain, dry the kiddo, feed her some hot chocolate (To those who have doubts over my culinary skills let me remind you dear readers about my 15 minutes of fame, when I won the pasta making competition?). 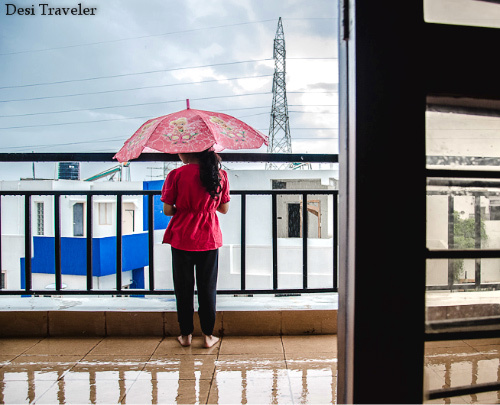 The naughty boy in me decided to pay a visit and I opened the balcony door, and allowed the kiddo to go out in balcony but with an umbrella, so that she does not get drenched. I could not resist taking some pictures of the kiddo with umbrella in the balcony. Soon the squeaks of joy from the kiddo became irresistible and I had joined her in the balcony. The poor little umbrella was no match for the mighty monsoon and was soon retired in a corner. Now it was just the kiddo, me and the monsoon at its full glory. The first few drops of rain that caress your face transport you to a magical land with rainbows and fairies. Soon the magic overtakes completely, you start losing sense of time and space, trying to catch as many raindrops on your palm, then on your tongue, totally following the lead of a 4 year old. While we were enjoying the rendezvous with rain, we totally forgot about everything under the sun or should I say under the clouds? Our laughter was punctured by the buzz of the door bell, which must have been trying to get our attention for some time, for it was screaming loud enough to reach us in the balcony. I rushed to the door, only to find Sasha and the elder one looking at me like hungry lionesses. “What is it Papa? We are ringing bell for 10 minutes and you are not even answering your phone” screamed my elder daughter, while dragging the day’s shopping bag inside. Sasha was too shell shocked at seeing a drenched me with a trail of water in our apartment from balcony to living room, with the younger one still dancing in balcony. I was wondering how come she was back so soon, “But you said you will come after some time” I muttered courage to ask her. You should have seen the maturity with which she controlled herself, till she has closed the door. “I met T’s mom in mall and she offered us lift in her car, so we came back early, and I can see you are not very pleased to see me back early” I was enlightened by her while examining the trail of water, that has now started forming a little pool near the sofa. The rest of the story is classified. Watch this space after 30 years, when the statue of limitations is lifted to release classified information.